I think leading a Culturama dance fits well under this learning outcome as we had to go through all 5 stages of creating a CAS experience. In this post I will highlight the process of the first 3 stages. I had taken part in Culturama as a dancer last year and had really enjoyed the experience. I realised this year would be the perfect year to try becoming a dace leader because I had some prior knowledge about the structure of Culturama, and the amount of commitment needed. I was lucky that my friend Alessia was also interested in being a dance leader and offered that we worked together. She was interested in leading a Jamaican dance, I saw this as a great opportunity and agreed to join her. 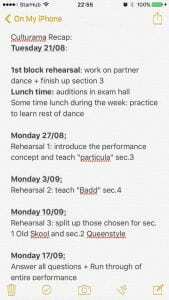 By stepping into this role I was hoping to improve my leadership skills, performance skills as well as my organisational skills, I was also hoping to create an enjoyable experience for our dancers. Alessia and I created this CAS experience as partners and took up different roles in the process. I took up the role of communicating with the Culturama committee and our dancers as well as helping with the choreography of the dance. Alessia took up the role of putting together the music and costumes as well as the choreography. 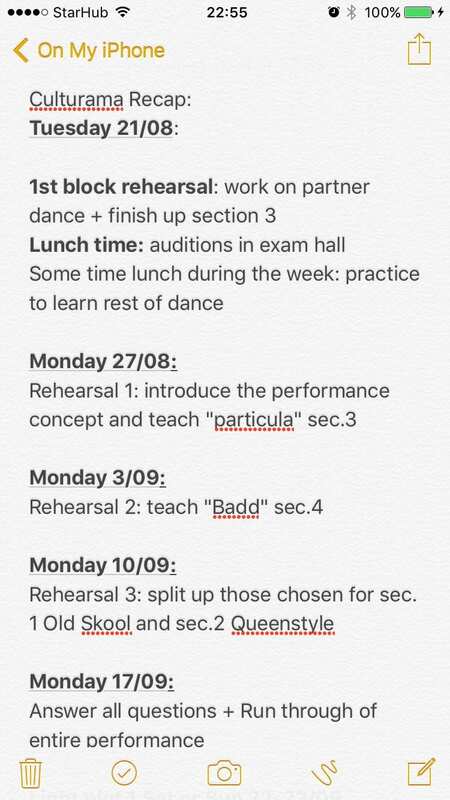 We worked together to create a rehearsal schedule and deciding the makeup for the dancers. The whole process started after we held auditions for the dance. Our auditions ran smoothly, but we had a hard time choosing 16 dancers out of the 70 that came for the audition. This decision-making process to us around 3 days and involved a lot of video calls, and face- to face discussions. But the process did not end just there because the accepted dancers also had to confirm whether they wanted to be in our dance or not. We were faced with the biggest challenge when we found out that all dancers were only allowed to take part in 1 dance, this led to us losing 10 dancers because they chose another dance over ours. Through this time we really had to work on being flexible and positive. We started thinking about ways to overcome this challenge, and started to pick reserves as well as ran a reaudition to choose new dancers. This required a lot of organisational work and communication with the Culturama committee. We then had a hard time choosing dancers from the new bunch and therefore then decided to expand our dance group, from 16 people to 18 people instead. We consciously made this decision because we knew it meant that we were giving more people an opportunity to experience Culturama. This was one of the main challenges we faced in the initial stages, and from this experience, I learned how to be more decisive as well as learned how to facilitate a larger group of people, which is a skill I can apply to other areas of my life as well.